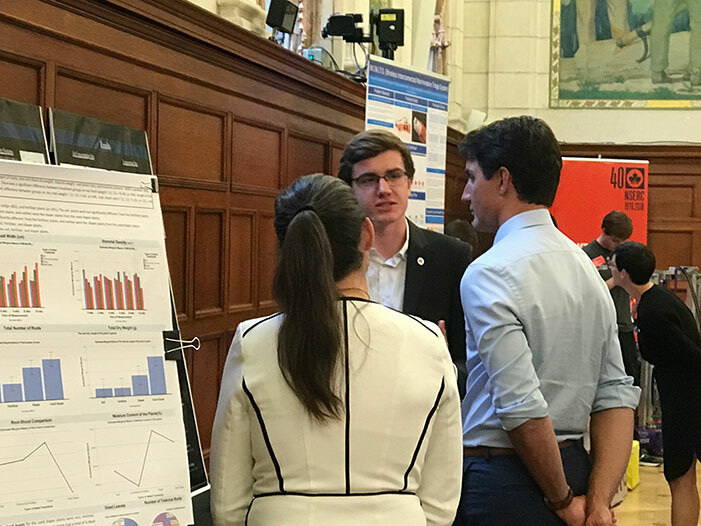 Jackson Weir, a first-year science student on UNB's Fredericton campus, presented his award-winning research project to Prime Minister Justin Trudeau at the second annual Prime Minister's Science Fair (PMSF) held on Sept. 19 in Ottawa. Mr. Weir was one of 35 students, ages 10 to 18, selected from 500 science, technology, engineering and math (STEM) award winners across Canada to present his project to Prime Minister Trudeau, Minister of Science and Sport Kirsty Duncan, and Nobel Prize winner Arthur McDonald. "I was truly inspired by the work of other aspiring scientists from across the country," says Mr. Weir. "The work showcased at this event proves that anyone with a bit of curiosity and the will to work hard can conduct significant research." Mr. Weir was selected to attend the PMSF based on his outstanding accomplishments at the 2018 Canada Wide Science Fair. His research project, Experimental Analysis of Environmental Factors: Surface Spread of Oil on Water, won multiple awards. Mr. Weir is the first person from New Brunswick to win a senior gold medal for his research. He also received the Senior Environmental Challenge Award and was offered $26,000 in scholarships. Like many teenagers, Mr. Weir helps with chores at his home in Saint John. Unlike most teenagers, a prize-winning idea for a research topic came to him while doing the dishes. He observed how oil reacted differently to water temperature in his kitchen sink. His research analyzed algorithms used to predict how oil behaves during a spill. He found that higher water temperatures caused oil to spread at a faster rate, while salt water slowed the distribution rate. "Small mistakes in storage or transport can result in devastating consequences for the environment," says Mr. Weir. "Hopefully my research will help increase prediction accuracy allowing decision makers to make more informed decisions when devising their cleanup efforts to reduce environmental damage." He recently published his findings in the Canadian Science Fair Journal. This summer, Mr. Weir had the opportunity to work alongside Dr. Alli Murugesan, president of BioHuntress Therapeutics Inc. and senior scientist at the Reiman Cancer Research Lab on UNB Saint John campus. "I find the process of identifying a problem, conducting experiments and presenting a solution very fulfilling," says Mr. Weir. "My experience at the lab with Dr. Murugesan solidified my goal of wanting to be a medical researcher." Dr. Murugesan, in collaboration with colleagues Dr. Tony Reiman and Dr. Mohamed Touaibia, has developed a nature-inspired compound that can target and destroy blood cancer cells. She supports Mr. Weir's goal to pursue a future in medical research. "I enjoyed interacting with Jackson, he is very bright," says Dr. Murugesan. "It was a delight to see his enthusiasm and thirst to learn. I wish him the very best for his future endeavours." 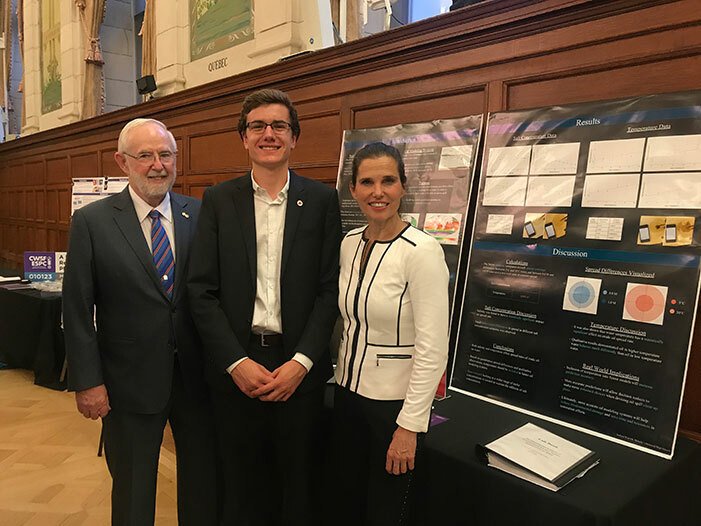 Photo 1: Nobel Prize winner Arthur McDonald, Jackson Weir and Minister of Science and Sport Kirsty Duncan at the Prime Minister's Science Fair in Ottawa. Photo 2: UNB student Jackson Weir presents his research project to Minister of Science and Sport Kirsty Duncan and Prime Minister Justin Trudeau at the Prime Minister's Science Fair on Sept. 19 in Ottawa.